The fascinating beauty of ocean is loved universally because water has an intense relationship with humans from time to time. Ocean is a pure gift from god and there is nothing more beautiful than the waves, tropical sea shells, the underwater creatures, exactly the dazzling treasures of ocean. Explore these natural beauties for this Christmas to decorate your home and bring a mini beach right indoor to amaze your family and friends. Still everyone behaves like a kid when left on a sea shore, running, playing with tides, picking shells, full of fun and happiness. Do you agree? 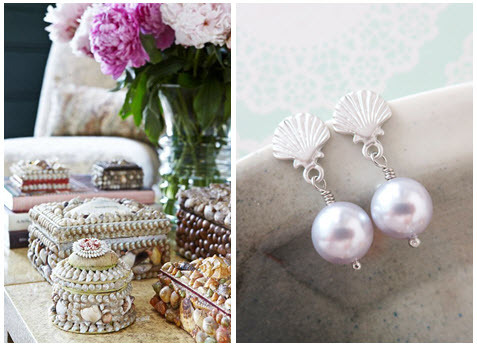 Just bring in the same mood at home and celebrate the beauty of shells this festive season. The coastal shores mussel shell wreath, mermaid glass mosaic sun catcher when hanged at your door step is sure to grab everyone’s attention. These cute décors can be displayed anywhere to style up the space. Enjoy your feast with these fascinating sea shell beauties. Each shell is the natures unique piece of art; nobody will stop loving these cute unimaginable creation of god. The beach sand globe along with the starfish and limpet shell frame, oyster shell trinket dish, shell glass vase would be a strikingly attractive and elegant centerpiece for the festive dinning. Add your favorite photo to the frame to cherish your beautiful memories for the occasion. “Sea is the limit” for shiny attractive ornaments to decorate the Christmas tree. 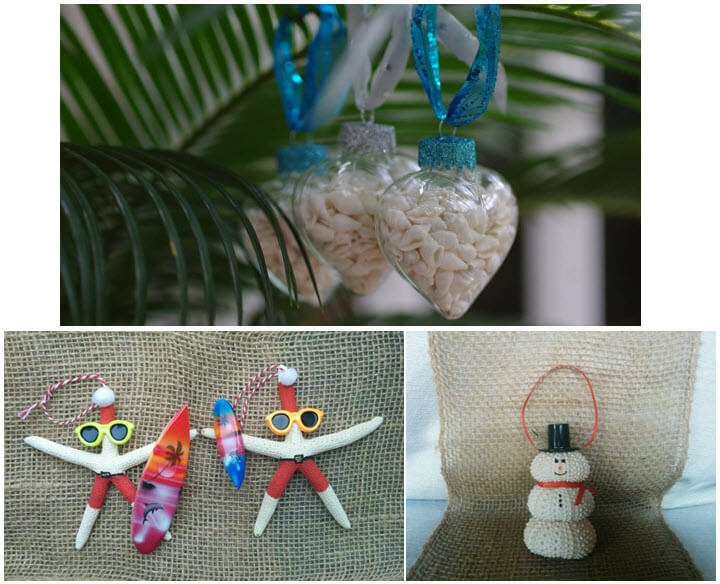 The heart shaped seashell ornament, Santa starfish, snowman will add jingle to the décor. There are lots and lots of varieties, shapes and colors to choose from that would bring a unique style to your tree. The sea gull seashell art, framed shells will liven up the dull walls adding an organic luxury to the décor.so what are you waiting for? 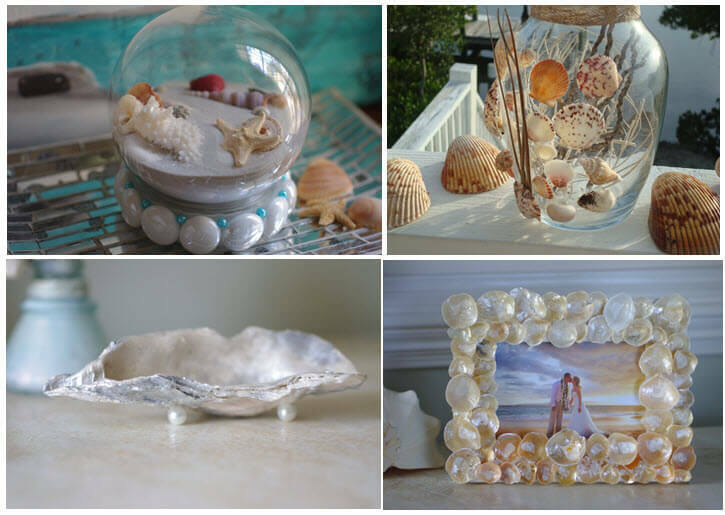 It is the right time to creatively display your shell collections to match your décor theme. Candle itself is beautiful, it become more attractive when combined with shells. 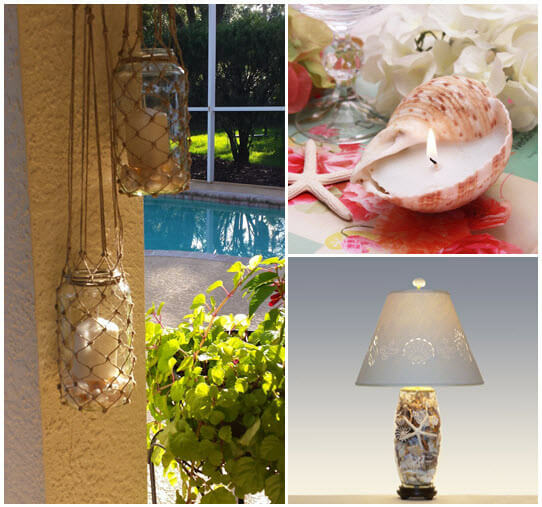 The knotted twine lantern with candle and shells, giant shell candle vessel are the perfect rustic addition to your beach theme. These pretty ones can be hanged or placed on tables to sparkle up the season. Bring home the seashell starfish lamp to brighten up with a coastal effect at home. Do you really want a beach bathroom for the holiday season? 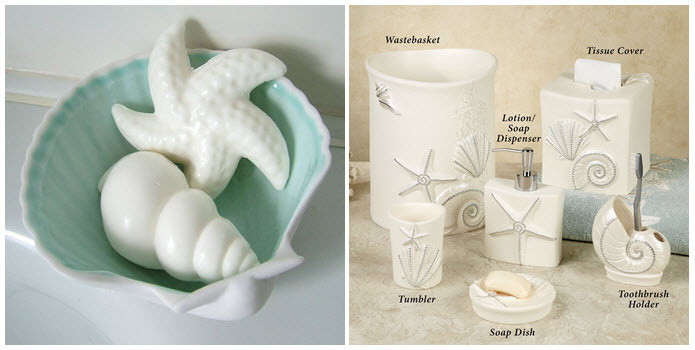 No worries when you have these seaquin shell accessories that would bring the beauty of beach to your bathroom. Try these off white scented glycerin sea shell soaps to give a fresh look and feel to your beach bath. The shell ear post with pear drop treasured in the antique shell box is the best gift that would completely flatter your lady love. Delight your loved one with the natures precious gifts this Christmas. Get ready to open up your old collection of shells or the new ones from your beach trips and pour your creativity to turn them out into astonishing décor pieces. Hang on to the beautiful sea shell ideas and turn your simple décor into a fantabulous one with these adorable gifts from nature. 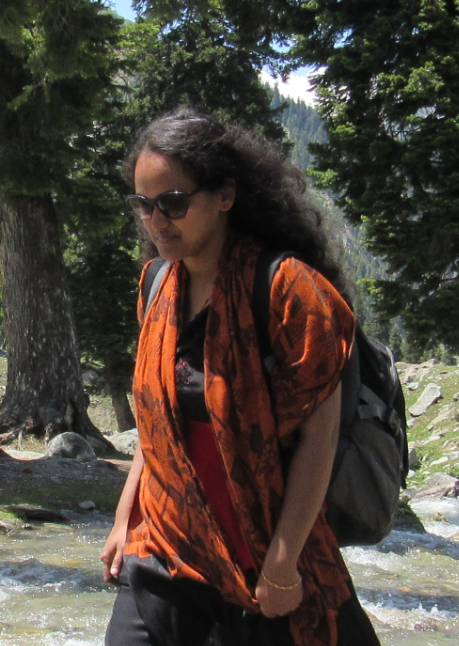 Get Set Go and enjoy the holiday season with these bunch of cool treasures. HAPPY TRIP TO BEACH…… AND MERRY CHRISTMAS.